Kabir News Tech Jelly Bean Update for Samsung Galaxy SII, What are the Benefits? Samsung Galaxy SII owners can now enhance their handsets with an Android 4.1, Jelly Bean update as recently announced by Sprint. This update brings in beautiful and fluid enhancements for the 2011 flagship smartphone. What can users expect to get from the update? Android 4.1 is touted to be the smoothest android version currently available, with Jelly Bean improving on the precursor Android 4.0 apart from introducing a convenient Google search factor. This makes for a richer Google experience on Android. Just what will this update do for your device? The main function of this update is to address your device’s OS upgrade to Android 4.1.2 (Jelly Bean). Having this OS on your handset provides several benefits that will definitely enrich your user experience. Jelly Bean transforms your device into a responsive unit even as it boosts your CPU when you touch the screen and turns it down when you don’t use it. Smooth transitions from the home-screen to apps is as effortless as turning the pages of your favorite book. Staying connected is also a matter of convenience as Jelly Bean puts you in control of your notifications, emails, and even your appointments. Expandability allows you a better look at your notifications and emails,and even your cherished photos on Google+. On the other hand, personalization makes navigation smoother than ever. Widgets re-size on their own in response to your movements, making interaction between you and your favorite apps as seamless, easy, and magical as can be. Snapping photographs was super fast with Android 4.0, Ice Cream Sandwich. With Jelly Bean, that same speed is brought into viewing, giving you the ability to instantly review photos by switching from filmstrip to camera view in accordance with your preference. At a loss for words when composing your messages? No need to worry! Jelly Bean automatically makes a guess of the next word even before you start typing it, with Android’s dictionaries now even more relevant and accurate. Voice typing is now also possible even without connection. Gesture mode, speech input, touch and swipe gestures; all of these combined with Braille input via USB or Bluetooth makes your device friendly even to blind users. The Android Beam also makes sharing even easier between NFC enabled devices. You can share all your screen’s content including complete web pages, videos, apps, and contacts by simply touching the two devices back to back and then tapping to beam the content you wish to share. 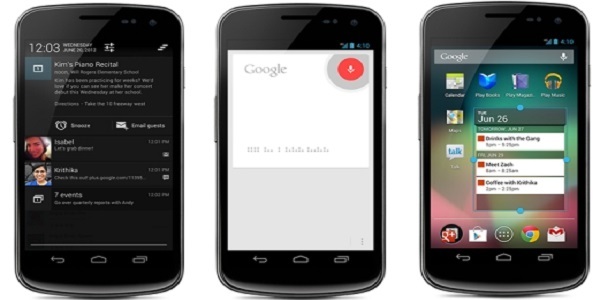 Jelly Bean also brings you a totally new Google experience, with Google Voice Search and Google Now making possible all the difference. Google Voice can search and speak to you in response to your commands. Google Now updates you on the weather and traffic before you go to work.